Most cacti come from arid climates and our image of a cactus is precisely that of a plant adapted to growing in harsh conditions: a swollen stem that holds water, no leaves in order to reduce moisture loss, abundant spines to protect its valuable assets, etc. You might imagine therefore that you need to sow cactus seeds in sand and under conditions of burning sun and great aridity… but you’d be wrong. In fact, in nature, not even one desert cactus seed in 100 germinates … and not even one seedling in 1,000 reaches maturity. Most years, there is no germination at all! The seeds can lie dormant for years if necessary, waiting for Mother Nature’s sign that it’s time to start growing: a good, thorough rain. And yes, it does rain in a desert … occasionally. Only then, when the soil is moist, do the seeds, often decades old, finally germinate. Seedlings then struggle to grow as quickly as possible, a real battle against the elements, but if the soil dries them out too quickly, they die. But from time to time, there’ll be a year when the soil remains moister than normal or when there are repeated rains. It’s under those conditions that the next generation of cacti really manages to get a good start. Sow in a small pot moistening the seed mix thoroughly and simply press the seeds into the soil. Cover with a dome or a transparent plastic bag to maintain high humidity. (I know: that sounds illogical for a cactus, but trust me, it works!) And place the pot in a warm, well-lit spot (light is necessary for germination), but away from direct sunlight, otherwise the poor seedlings will get too hot inside their clear plastic shelter. A location under a grow light is perfect. 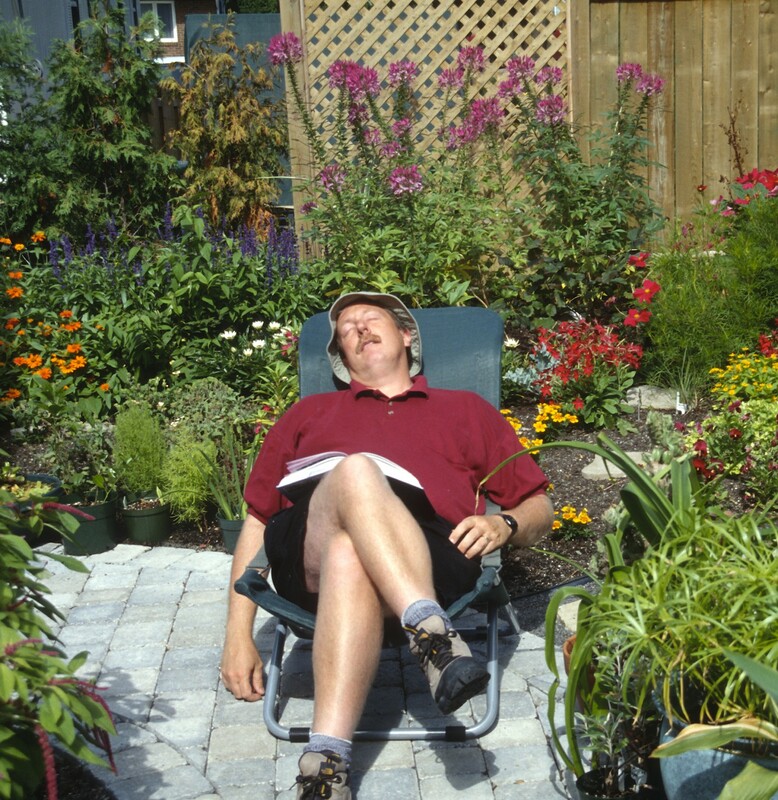 Germination can take from several days to several weeks. Curiously, even though most cacti have no leaves as adults, they will as seedlings. Each chubby seeding bears 2 cotyledons, just like any other dicot plant, only much thicker. At the junction of the two cotyledons a bit of spiky growth will soon appear: the stem of the baby cactus. As long the seedlings are under plastic, no watering should be necessary, although if the soil surface does dry out, you could lightly spray the growing mix with water. After 2–3 months of growth, gradually remove the plastic bag or dome, opening or lifting it a bit more each day until the seedlings harden off. Once the seedlings have acclimatized to indoor conditions, transplant each into its own small pot. This time, use a cactus potting soil. Start watering them like a typical houseplant (not quite like a desert cactus at this point), that is, when the soil is dry to the touch. Moderate lighting is also still the best choice at this stage. It is only about a year after the seedlings have been growing on their own that you should begin treating them “like cactus,” placing them in full sun and letting the soil dry out thoroughly before watering again. Cacti are fairly slow growers, but some will be quite presentable by their second year. How long before they bloom? Mammillarias or rebutias may reach blooming size in as little as 2 to 3 years, but most small cacti are 5 or 6 years away from blooming. As for candelabra and barrel types, figure 15 to 50 years… if indeed they ever bloom. Obviously, there are exceptions to the sowing recommendations made above. Several opuntias from northern areas, for example, will require an extensive cold treatment before germinating, but otherwise, the process described above will work well with almost any desert cactus. Although the information above was written with cactus in mind, most other succulents also need coddling when they first germinate. Whether it be agaves, aloes, euphorbias or crassulas, when you sow them, give them high humidity and only moderate light until they’re well established. In other words, baby them at first. They’ll love you for it! 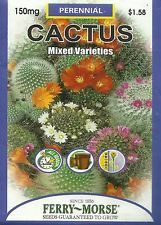 Packs of mixed cactus seeds are available in most garden centers. You’ll probably find packets of mixed cactus or cactus and succulent seed in your local garden center and most of the larger seed catalogs (Stokes Seeds, Park Seed, Halifax Seeds, Chiltern Seeds, etc.) also offer them. For a more extensive selection of cactus seeds, ideal for the cactophile, try Cactus Store or Mesa Garden (USA), RarExoticSeeds (Canada) or Kakteen (Europe). One of the best cactus seed growing info blogs I’ve found! Thanks!